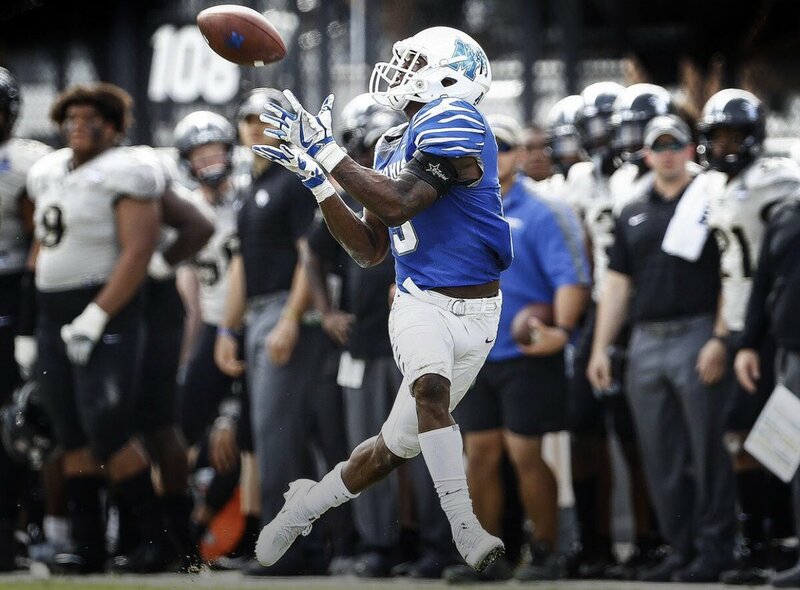 Memphis wide receiver Anthony Miller was one of the Vikings' top-30 visitors this week. Daniel House analyzes his skill-set and how he would fit in Minnesota. Updated: April 6, 2018, 2:30 p.m.
Memphis wide receiver Anthony Miller was one of the Vikings' top-30 visitors this week. He has drawn plenty of NFL interest, especially after shredding all of the expectations teams had for him at the Memphis Pro Day. A skilled playmaker with the ball in his hands, Miller is starting to gain momentum in the draft community. He was recovering from a foot fracture and didn't participate in on-field drills at the NFL Scouting Combine. However, Miller posted a vertical jump of 39 inches and ran his 40-yard dash in 4.46 seconds at his recent pro day. He has tested well and proven he is healthy, which pairs nicely with an impressive film compilation. Miller put up impressive numbers last year, shattering records held by a school legend. He now holds the Memphis single-season record for receiving yards, passing the mark set by Isaac Bruce. Miller and Bruce are the only two Memphis 1,000-yard, single-season receivers in school history. Last year, Miller had 95 receptions, 1,434 receiving yards, 14 touchdowns catches and eight 100-yard receiving games. All of the success almost didn't happen either. Miller connived the Memphis football staff that he was worthy of walk-on consideration. He proved to everyone how hard he was willing to work. It's clear all of the effort paid off. When you watch Miller's games on film, you see a very technically sound player. He is one of the most efficient route runners in this class. He uses a nasty head fake to sell double moves and his releases are very abrupt. When he gets to the stem of his route, Miller is very sudden and explosive. He gains extensive separation from running efficient routes. You don't often see this type of ability from many draft prospects. His skill-set reminds me of a cross between Eagles wide receiver Nelson Agholor and Seahawks wide receiver Doug Baldwin. Both of those players are technicians and display fantastic technique and feet. Miller has this type of potential playmaking ability. When he runs routes out of the slot he spins defensive backs around with a quick plant of his outside foot, while driving/exploding off the line. He does an excellent job of sinking his hips and getting a step on defensive backs when they are playing tight coverage. In the clips below, you'll see the kind of route running I'm talking about. He is particularly fantastic when he's asked to stretch the field vertically. His double moves and releases are very smooth and sudden. He wins consistently when he is asked to run routes deep down the field. Last year, six of of Miller's 14 touchdowns catches were 40 yards or more. Much of this was a direct result of his detailed and sharp route running. Not only does he have the technical side of the game down, but his hands and body control stand out. When the ball is thrown his way in traffic, he can adjust and come down with the pass. Miller makes difficult grabs at the catch point look easy. He measures in at just 5-foot-11, but he uses his body so well to hauls in passes. He also has very strong hands to make difficult grabs in tight spaces. In the clip below, he manages to high point the pass while being face guarded by the defensive back. He also has the body control to maintain his footing to track the throw into his frame. Another example is in the clip below vs. Central Florida. Miller doesn't have much room to work, but gets a slight ounce of separation via his start. He sells the route well and tracks the pass beautifully to make the contested grab. For a player with his size, he does an excellent job of making these type of plays look very easy. He plays with a very noticeable competitive edge and has the ability to take over certain stretches of games. Miller was the life of Memphis' offense and was easily the favorite target of quarterback Riley Ferguson. He would often throw the ball up for grabs and let Miller make plays on the ball. The great thing about Miller is the fact he can line up inside at the slot wide receiver position or play on the perimeter. This type of position flexibility is something which would provide Vikings offensive coordinator John DeFilippo with the luxury to create mismatches. It is something DeFilippo has preached throughout his career. He also wants to find ways he can move players across the field and Miller is that type of versatile receiver. According to Pro Football Focus, Miller ranked third among active wide receivers with 3.69 yards per route run from the slot. He also was dominant on the outside, especially in the red zone. Miller has a very unique skill-set and would fit nicely with Stefon Diggs and Adam Thielen. All three of them are fantastic route runners and can create explosive plays. Miller has the ability to be placed in space to make plays and has another gear in the open field. Below is a clip of him running a wide receiver screen and completing an excellent run after the catch. In a way, Miller's college tape reminds me of what we saw from Stefon Diggs at Maryland. There were bursts of dominance, but not a large sample size due to injuries. Part of Miller's issue was injuries, but he also didn't play for most of his first two years because he was a walk-on. If the Vikings can't re-sign Diggs, Miller could be a guy with the ability to fill the role. If Diggs does return, with Kendall Wright signing just a 1-year contract, Miller could take that job. He also has experience as a punt returner and could see reps on the kick return team. Anthony Miller is the most underrated receiver in the draft class. His production, testing numbers and increased faith in his durability could cause him to rise up draft boards. Right now, my guess is that he'll land in the early third round range with a chance to get picked in the second round. However, concerns about his ankle and the fact he is 23 years old might cause him to be available when the Vikings are on the clock at selection No. 94. The Vikings could also elect to trade back out of round one, which would give them additional picks to fill needs, while adding an additional talent like Anthony Miller to their wide receiver room.